This reusable silicone bag cuts down on waste by replacing throwaway plastic baggies. 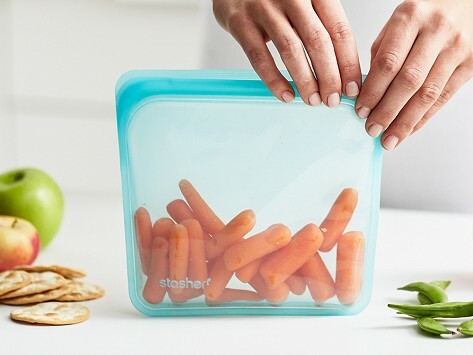 Each is completely plastic-free, and seals up to keep food fresh. 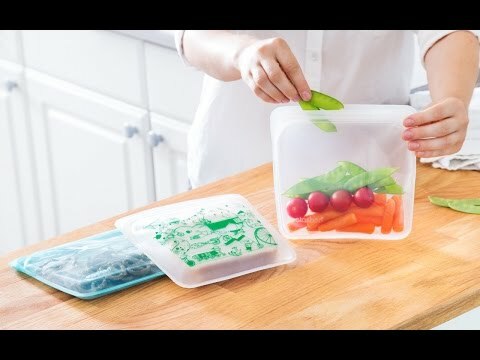 Eco-friendly, too, the bag is lunch box-ready, and can go from the pantry into the freezer, microwave, or dishwasher without worry. Is there anything this mighty bag can’t do? Well, it won’t break down like plastic does—or get tossed away. Dimensions: 7" x 7.5" x 0.5"
Love this! Use it every week for work. Work great. Love that you can see what’s inside. Little hard to open. For something so flimsy, disposable plastic baggies can really add up. But these durable, reusable silicone bags do the same job—and more—without any waste. stasher bags are made entirely of silicone. There’s no plastic in them—as well as no BPA, phthalates, and latex. And, unlike their plastic counterparts, these bags have way more uses. Just make sure to press the seal firmly and squeeze excess air from the bag to help close it up tight. They can go in the freezer, microwave, and dishwasher. They can even handle boiling water, so you could cook with one, too—sous vide, anyone? The pure platinum silicone is non-porous, so bacteria can’t grow, keeping food fresher. Besides snack duty, you can use a bag to store household odds and ends, or to keep toiletries mess-free on trips. A clear window lets you peek inside, and you can label each bag with a dry erase marker. The waste of plastic bags wore Founder Kat Nouri down. She channeled her frustration into creating an eco-friendly alternative—and now those one-use bags are a thing of the past.